Seattle Reign FC clinched a playoff spot with a 2-0 win over the Houston Dash on Tuesday night at UW Medicine Pitch at Memorial Stadium in Seattle, Washington. Reign forward Jodie Taylor scored two goals in three minutes to give Seattle the win. It’s Seattle’s record-tying 12th clean sheet of the season. The second-place Reign moved to 11-4-7 (40 points) with the win. The Dash are now 8-9-5 with 29 points — they are still in the playoff chase, but have just two games left to play. It’s the first appearance in the NWSL playoffs for the Reign since 2015, after winning back-to-back NWSL Shields in 2014 and 2015. In 2016 and 2017, the Reign finished fifth, just missing the playoffs. Now, they’re in second place and have a chance to host a home playoff game. The Reign join the 2018 NWSL Shield winners, the North Carolina Courage, as the only teams to have clinched a playoff spot so far. Seattle Reign FC controlled possession in the match (56.2% to 43.8%) and outshot the Dash 16-13 and 8-3 in shots on goal. The match was played amidst smoke in the Seattle area due to wildfires, the third straight game the Reign have had to play in such conditions. Once again, the NWSL added extra hydration breaks (at 15′, 30′, 60′ and 75′) and had oxygen tanks on the sidelines due to poor air quality. The Reign scored both of their goals in the second half, but had chances in the first half. The first came when Jess Fishlock rocketed a shot off the post in the seventh minute. At the end of the first half, after a foul was called on Amber Brooks for a challenge with Megan Rapinoe, the Reign forward had a free kick from about 30 yards out. Rapinoe struck it with her right foot, aiming for the top corner, but Dash goalkeeper Jane Campbell pushed it out of bounds. Campbell made six saves in the match, including stopping Fishlock’s deflected shot in the 53rd minute. But eventually Taylor got the better of Campbell, with goals in the 58th and 61st minutes. Her first was a finish off a cross from Theresa Nielsen. Her second, a looping shot on an assist from Rapinoe. Taylor now has nine goals on the season, tied for fourth in the Golden Boot race. The Dash nearly pulled a goal back in the 75th minute following a shot from Kealia Ohai. Reign goalkeeper Lydia Williams made the initial save, but defender Kristen McNabb nearly hit the rebound into her own net. The post came up with the save to keep the shutout going. Williams made three saves in the match. The Reign now have 12 clean sheets in 2018, tying the record set by the Courage last season. Like the Courage in 2017, this year’s Reign team has done it with work from two goalkeepers. Williams earned her 10th shutout of the season on Tuesday night and Michelle Betos has two this year as well. The Reign have allowed just 15 goals this season, best in the league. The Reign played the match without midfielder Allie Long, who is out with a right knee sprain suffered last week. Rapinoe returned after missing last week’s game due to left hip soreness and played 70 minutes on the night. Match ends, Seattle Reign 2, Houston Dash 0. Second Half ends, Seattle Reign 2, Houston Dash 0. Attempt saved. Sofia Huerta (Houston Dash) right footed shot from the left side of the box is saved in the centre of the goal. Assisted by Rachel Daly. Attempt missed. Sofia Huerta (Houston Dash) header from the centre of the box misses to the right. Assisted by Nichelle Prince with a cross. Substitution, Houston Dash. Nichelle Prince replaces Allysha Chapman. Corner, Seattle Reign. Conceded by Veronica Latsko. Attempt missed. Haley Hanson (Houston Dash) right footed shot from outside the box misses to the left. Assisted by Linda Motlhalo. Substitution, Seattle Reign. Christen Westphal replaces Stephanie Catley. Substitution, Seattle Reign. Elizabeth Addo replaces Jasmyne Spencer. Attempt missed. Thembi Kgatlana (Houston Dash) right footed shot from the right side of the box misses to the left. Assisted by Rachel Daly. Attempt blocked. Sofia Huerta (Houston Dash) right footed shot from outside the box is blocked. Assisted by Amber Brooks. Attempt saved. Kealia Ohai (Houston Dash) right footed shot from the left side of the box is saved in the top left corner. Attempt saved. Jasmyne Spencer (Seattle Reign) left footed shot from the right side of the box is saved in the bottom right corner. Assisted by Jodie Taylor. Attempt missed. Rachel Daly (Houston Dash) right footed shot from outside the box misses to the left. Assisted by Linda Motlhalo. Substitution, Seattle Reign. Nahomi Kawasumi replaces Megan Rapinoe. Attempt missed. Jodie Taylor (Seattle Reign) right footed shot from outside the box misses to the left. Assisted by Morgan Andrews with a through ball. Attempt missed. Sofia Huerta (Houston Dash) header from the right side of the six yard box misses to the left. Assisted by Rachel Daly with a cross. Attempt missed. Morgan Andrews (Seattle Reign) left footed shot from the centre of the box misses to the left. Assisted by Stephanie Catley with a cross. Attempt blocked. Linda Motlhalo (Houston Dash) right footed shot from outside the box is blocked. Assisted by Taylor Comeau. Attempt blocked. Rachel Daly (Houston Dash) right footed shot from more than 35 yards is blocked. Goal! Seattle Reign 2, Houston Dash 0. Jodie Taylor (Seattle Reign) right footed shot from outside the box to the top right corner. Assisted by Megan Rapinoe. Attempt saved. Jodie Taylor (Seattle Reign) right footed shot from the centre of the box is saved in the centre of the goal. Assisted by Megan Rapinoe. Goal! Seattle Reign 1, Houston Dash 0. Jodie Taylor (Seattle Reign) right footed shot from the centre of the box to the bottom left corner. Assisted by Theresa Nielsen with a cross. Hand ball by Jodie Taylor (Seattle Reign). Attempt blocked. Amber Brooks (Houston Dash) header from the centre of the box is blocked. Assisted by Sofia Huerta with a cross. Corner, Houston Dash. Conceded by Megan Oyster. Attempt saved. Jessica Fishlock (Seattle Reign) right footed shot from outside the box is saved in the centre of the goal. Assisted by Megan Rapinoe. Corner, Seattle Reign. Conceded by Janine van Wyk. Attempt blocked. Jessica Fishlock (Seattle Reign) header from the centre of the box is blocked. Assisted by Megan Rapinoe with a cross. Attempt saved. Megan Rapinoe (Seattle Reign) right footed shot from outside the box is saved in the bottom left corner. Assisted by Stephanie Catley. Attempt missed. Sofia Huerta (Houston Dash) right footed shot from the right side of the box is too high. Assisted by Rachel Daly. Offside, Seattle Reign. Kristen McNabb tries a through ball, but Stephanie Catley is caught offside. Attempt missed. Megan Rapinoe (Seattle Reign) right footed shot from outside the box is high and wide to the right. Assisted by Jodie Taylor. Attempt saved. 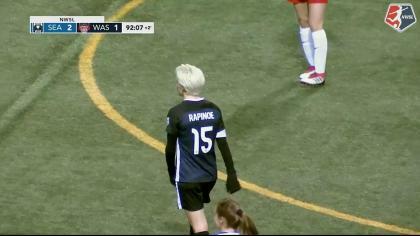 Megan Rapinoe (Seattle Reign) right footed shot from outside the box is saved in the top right corner. Attempt missed. Jodie Taylor (Seattle Reign) header from the centre of the box misses to the left. Assisted by Theresa Nielsen with a cross. Attempt blocked. Morgan Andrews (Seattle Reign) right footed shot from outside the box is blocked. Assisted by Megan Rapinoe. Attempt saved. Sofia Huerta (Houston Dash) left footed shot from outside the box is saved in the centre of the goal. Attempt missed. Morgan Andrews (Seattle Reign) right footed shot from the left side of the box is close, but misses to the left following a corner. 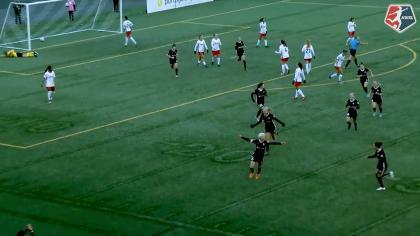 Jessica Fishlock (Seattle Reign) hits the left post with a right footed shot from outside the box. Assisted by Megan Rapinoe. Hand ball by Stephanie Catley (Seattle Reign). Attempt saved. Jodie Taylor (Seattle Reign) left footed shot from the right side of the box is saved in the top centre of the goal. Assisted by Jessica Fishlock.